Deuterocohnia lotteae (Rauh) M.A.Spencer & L.B.Sm. Origin and Habitat: Southern Bolivia. Altitude range: Deuterocohnia lotteae grows from 2500 to 3000 metres above sea level. Habitat: This species forma tight cushions on steep dry hills. Description: Deuterocohnia lotteae (synonym: Abromeitiella lotteae) is a mall offsetting terrestrial bromeliad forming tight mossy-looking mounds of hard spiny rosettes to 60 or more cm across. D. lotteae closely resembles a larger form of Deuterocohnia brevifolia (synonym: Deuterocohnia chlorantha), from which it is distinguished by its flower colour. The latter has emerald-green flowers that blend in with the foliage. In D. lotteae only the tips are green on the purplish-red or maroon tubular perianth. Derivation of specific name: It is named for Mrs. Lotte Hromadnik, who collected the plant with her husband, Dr. R. Hromadnik, at the type locality in southern Bolivia. Leaves: Mostly green, almost glabrous on the upper side. Although the taxonomic relevance of foliar scale structure within Deuterocohnia is expected to be low, a thorough investigation of several individuals of all species would be necessary to clarify this aspect. The differences listed above rather seem to be a matter of intraspecific variability of the scales (peltate trichomes)on the upper side within the same plant and among different localities. Some taxonomic value may however be associated with the overall density of the foliar scales which is typically high in the related Deuterocohnia abstrusa and Deuterocohnia recurvipetala, where it causes a greyish appearance. Inflorescences: Sessile, nestled among the foliage. The inflorescence contains secondary wood and produces flowers, on the same scape for up to six years. 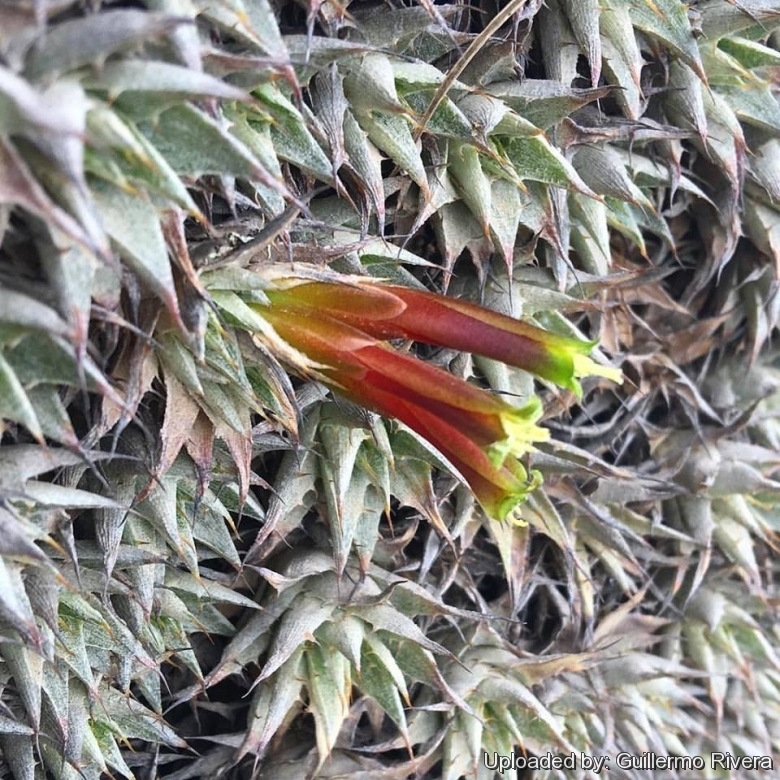 Flowers: Tubular, brown-wine-red with green tips. Taxonomy: Deuterocolmias are also part of the group Pitcairneoideae — thought to be one of the most primitive, they are also confused with dyckias until they flower   . 2) Deuterocohnia lotteae (Rauh) M.A. Spencer & L.B. Sm., Bradea 6: 145. 1993. 4) Rauh, Werner. 1983. “Abromeitiella lotteae. A remarkable new species from southern Bolivia”. J. Brom. Soc. 33:239—242, 252. 5) Rauh, Werner. 1983. Abromeitiella lotteae. Bromelienstudien. XIII Mitteilung: 5-12. Cultivation and Propagation: Grow it like succulents in in full sun to light shade and well drained soil. They are slow growing and Plants very drought tolerant. They should be watered regularly especially during summer months, keep dry in winter. It is probably one of the cold hardiest of the bromeliads, but detesting winter wet on its foliage, proves difficult to keep outside. Propagation: Deuterocohnia lotteae is propagated by division and from seed when available.